""A fly was flying. He was looking for something to eat. Something tasty. Something slimy. A boy was walking. He was looking for something to catch. Something smart. Something for The Amazing Pet Show."" The boy and fly meet and so begins a beautiful friendship. Er, and so begins a very funny friendship. Using hyperbole, puns, slapstick, and silly drawings, bestselling author/illustrator Tedd Arnold creates an easy reader that is full of fun. With an eye-catching holographic cover. This is the first in a series of four. Fly Guy loves the school lunchroom. He loves the dirty dishes, the smelly mop, and the garbage cans. 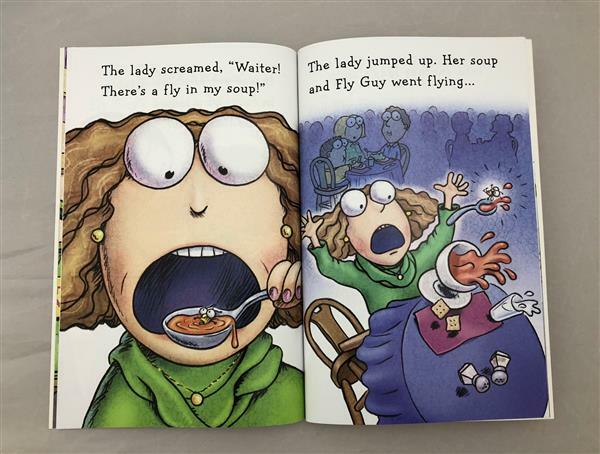 But when the lunch ladies discover there's a fly in the cafeteria, chaos ensues! Though Fly Guy makes a mess of things, he also shows his powers as a Super Fly Guy! Using hyperbole, puns, slapstick, and silly drawings, bestselling author/illustrator Tedd Arnold creates an easy reader that is full of fun. She's about to swallow a horse, when Fly Guy shouts: ""BUZZZ!"" Buzz is starting to worry, but there is nothing Fly Guy can't handle! He flies out, and all the critters follow. And everybody parties! 05. Fly High, Fly Guy! Mom and Dad won't let Fly Guy go along on the family road trip. They're afraid he'll get lost. But when Dad accidentally shuts him in the trunk, Fly Guy goes along for the ride! First, Fly Guy gets lost at the picnic site--but he shows up in the garbage can. Then he gets lost at the art museum, but he shows up as part of a modern painting. At the beach, he turns up in a shell, and at he amusement park, on Buzz's hot dog (yuck!). 06. Hooray For Fly Guy! "Flies can't play football," says the coach. But Fly Guy and Buzz are determined to prove him wrong. 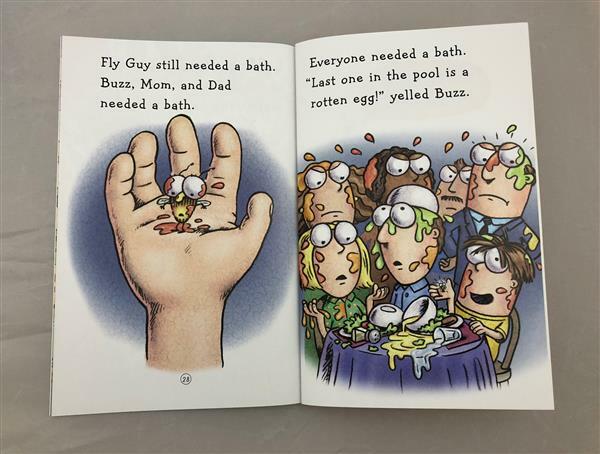 New readers will experience both pride and delight as they read the simple text and look at the funny pictures of Fly Guy trying to kick a football, go out for a pass, and tackle his friend Buzz. In the end Fly Guy scores and gets to do his hilarious touchdown dance. 07. I Spy Fly Guy! When Fly Guy and Buzz play hide-and-seek, Fly Guy hides in his favorite place--the garbage can. But as Buzz finishes counting, the garbageman drives away with the garbage and Fly Guy, too! A very worried Buzz follows the truck to the dump, where he sees zillions of flies. Where is Fly Guy?! Time after time, Buzz thinks he spies Fly Guy, only to be snubbed, boinked, or bitten. Then he realizes they've been playing a game. He yells, "I give up. You win!" And Fly Guy leaves his new hiding place--he was on top of Buzz's hat all along! 08. Fly Guy Meets Fly Girl! Fly Guy has met his match, and her name is Fly Girl. Fly Guy can do fancy flying. Fly Girl can do fancier flying. Fly Guy can eat gross stuff. Fly Girl can eat grosser stuff. Fly Guy can say his boy's name--Buzzzzzz! And Fly Girl can say her girl's name--Lizzzzzzz! Fly Guy is totally impressed, and totally smitten. Will Fly Guy and Fly Girl get married and leave Buzz without his dear pet? 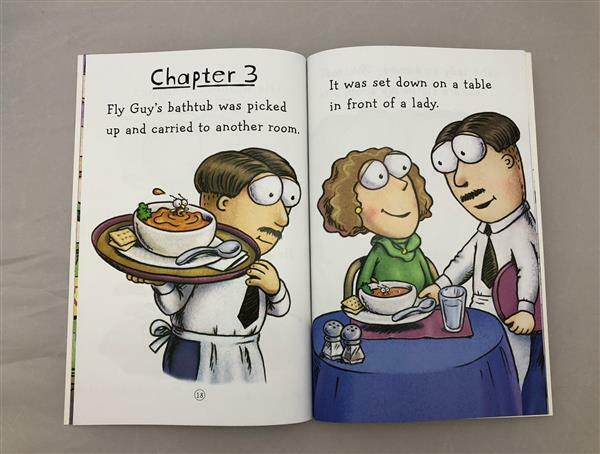 The excitement is jam packed in Fly Guy's newest episode which features a comic book within the story. Buzz and Fly Guy are superheroes! The dynamic duo must battle a fiery dragon and a band of pirates. Will Fly Guy and Buzz Boy defeat their enemies and save their home? Find out in this ama-zzzing early chapter book. 10. Fly Guy VS. The Flyswatter! 11. Ride, Fly Guy, Ride! Dad takes Fly Guy and Buzz for a car ride, but in a funny and wacky turn of events, Fly Guy is blown out of the car window and into a passing truck, where he lands in the driver's mouth! The driver spits him out, and Fly Guy tumbles onto a boat. Fly Guy then winds up on a circus train with an elephant and then an airplane ... and he just misses taking off with a rocket ship! Get ready for Fly Guy's wacky new tricks as he saves the day! 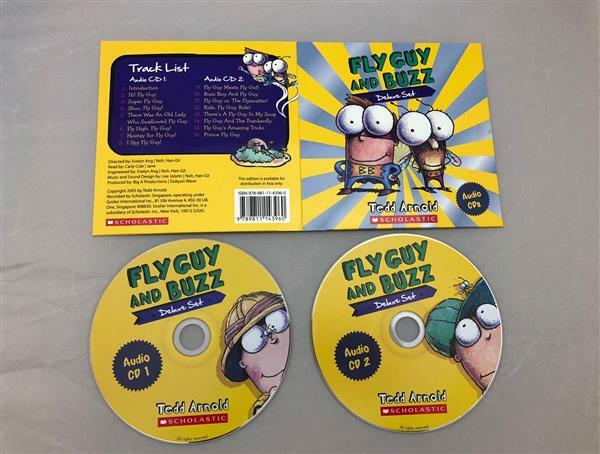 In the latest installment of Tedd Arnold's New York Times bestselling Fly Guy series, Fly Guy puts on a show with all the new tricks that Buzz taught him. But when Fly Guy shows off The Backstroke, The Dizzy Doozie, and The Big Booger at dinner-time, Buzz tells Fly Guy only to do the tricks on command. The tricks come in handy when an annoying kid starts picking on Buzz and Fly Guy - and by the time Fly Guy pulls off The Big Booger, he runs away. Once upon a time, Buzz writes a fairy tale for a class assignment and Fly Guy becomes a handsome prince! 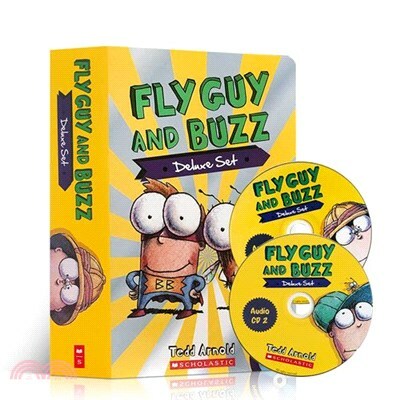 In the latest installment of Tedd Arnold's NEW YORK TIMES bestselling Fly Guy series, Buzz has a homework assignment to write a fairy tale and he asks Fly Guy to help. Fly Guy doesn't like to think of himself as some of Buzz's suggestions--an ugly troll, a smelly pig herder--so he becomes a handsome prince instead! Prince Fly Guy flies to a dark castle, fends off a giant, and rescues a beautiful princess. 06. Fly High, Fly Guy! 07. Hooray For Fly Guy! 08. I Spy Fly Guy! 09. Fly Guy Meets Fly Girl! 11. Fly Guy VS. The Flyswatter! 12. Ride, Fly Guy, Ride!